A threadbare update of a forgettable platformer, Operation Robocod for Switch seems destined to sink without a trace. Despite the Switch’s much-lamented lack of a true Wii/U-style Virtual Console, its retro reissue library continues to fill out quite nicely, as publishers seemingly take it upon themselves to fill the void. Between M2’s SEGA AGES releases and last year’s Mega Drive collection, most SEGA staples are covered, so we’re hoping to see some deeper cuts make an appearance going forward. Here in the UK, the ‘80s proto-PC-come-games console, the Amiga, was very popular. In time, many Amiga games found their way onto the Mega Drive; a number of now household names such as Worms and Cannon Fodder made the leap to SEGA’s 16-bit console and others. 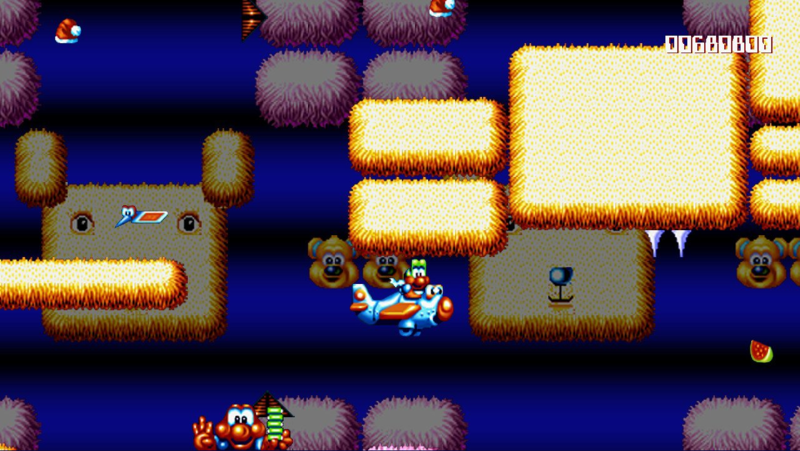 James Pond 2: Operation Robocod released on both formats in 1992, and has now made a surprise reappearance on the Switch eShop. As you’ve no doubt deduced for yourselves by now, James Pond is a somewhat strange, fish-based riff on everybody’s favourite 00 agent. While it’s easy to shake your head at such ridiculousness nowadays when so many games are awash with moody, gritty realism, it’s worth remembering that James Pond is from a simpler time, when what passed for ‘plot’ was merely an excuse for a cutesy cartoon character to run around and collect stuff. But, as straightforward of a platformer as this is, some kind of context, direction or even the faintest clue as to what you’re actually supposed to do and why wouldn’t have gone amiss here. There’s no digital manual, tutorial, ‘how to play’ option in the menus or similar on offer at all. These screenshots make the game look worse than it actually is in motion. But it’s still not great. Indeed, on getting to the title screen and starting a new game, you find yourself in front of a Christmas-themed icy castle – the game’s overworld of sorts – left to figure out the controls for yourself. At least they’re simple enough; in fact, the only gameplay mechanic of note here is that Pond can extend his body vertically to grab high ledges. Again, quite why and how a secret agent fish in a Robocop suit can do this is anyone’s guess. From here you’ll deduce in short order that the objective is to collect all of the clown toys in each themed world, before periodically fighting a boss. Really, that’s all there is to it. Pond feels satisfying enough to control, felling various enemies through the tried and tested jump-on-its-head approach. Awkwardly placed spikes will, of course, also attempt to impede your progress. Every so often there’s a vehicle thrown into the mix as a change of pace, but the plane in particular is quite frustrating to control, so much so that you might just be glad when it’s over. Operation Robocod’s graphics are an interesting talking point. Though individual sprites are pretty detailed, the game is quite dull visually for a couple of reasons. Firstly, in each themed world the same small pool of assets is simply recycled over and over. Secondly, backgrounds are little more than wallpaper-style repeated patterns, with no real sense of scale or purpose. The exquisite, pixelated vistas of many of Robocod’s contemporaries make it look crude and cobbled-together by comparison. A fish prentending to be a secret agent, in a Robocop suit, in a plane. What’s more, there’s quite a gulf between how well the game scrubs up overall in handheld and docked modes. Sprites are upscaled well enough in the former, but with your Switch hooked up to your TV, it’s a different story altogether, as the limitations of whatever filter or upscaling solution is being utilised are laid bare. The edges of the game’s sprites look somewhat washed out and imprecise, and odd artifacts and inconsistencies suggest a lack of time, effort or both. There’s little you can do about this because many of the basic features we’ve come to expect from these kinds of retro releases are notable by their absence in this case. There are no display options, such as scanlines, a 4:3 aspect ratio or filters at all. Moreover, the only gameplay affecting variable on offer here is the ability to give yourself infinite lives. In the context of M2’s aforementioned stunning work on the SEGA AGES series (and many others) this barebones approach is somewhat disappointing. Audio fidelity is passable, but betrays the fact that this port is probably not based on the Mega Drive release, which featured a much more basic soundscape. In-game music is mostly Christmas-themed, and honestly, it did feel a bit strange listening to a Jingle Bells chip tune in spring. 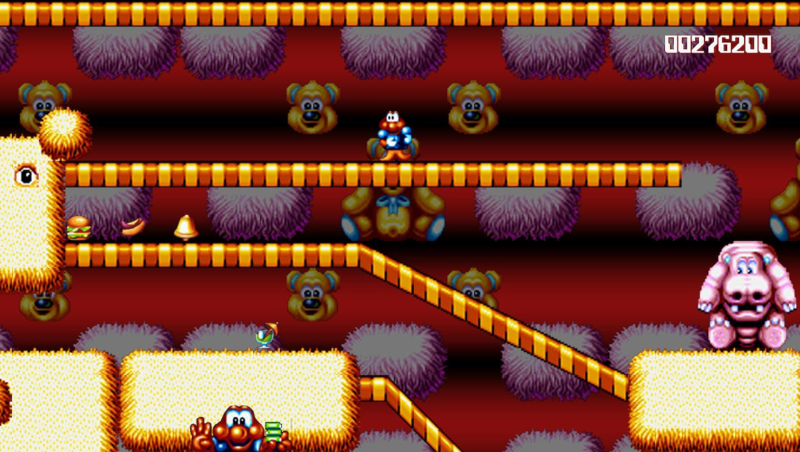 Unfortunately for Operation Robocod, the eShop is positively swimming in retro 2D platformers, both retro re-releases and more recent indie efforts. The underlying game is forgettable, the restoration work sloppy, and lack of features very disappointing. On a console that’s quickly becoming a real Mecca for lovingly crafted and curated nostalgia, this simply isn’t good enough. Gaming veterans with particular affection for Pond’s past exploits may enjoy the trip down memory lane, but as for everyone else – your £9.99 (or local equivalent) is better spent elsewhere. – Christmas music all-year-round. Unless that’s your jam, of course.